This month my skin overall has been pretty good and I think it's down to drinking a lot of water and finding a routine and products that work well. The standout product from February has to be the Una Brennan pre-cleanse oil which has really helped to get rid of dry patches. I'm impressed with how long the Dior micellar water has lasted as I've been using it for two months now. Other micellar waters I've used have only lasted me a month so despite it being more expensive, it does last a lot longer. Dior Instant Cleansing Water // Super Facialist By Una Brennan Rose Hydrate Miracle Makeover Facial Oil // RMK Cleansing Balm // Trilogy Hydrating Mist Toner // Caudalie Vinosource S.O.S Thirst Quenching Serum // Caudalie Vinosource Moisturising Sorbet // Clinique All About Eyes // By Terry Baume De Rose. What's been your most used skin care product this month? 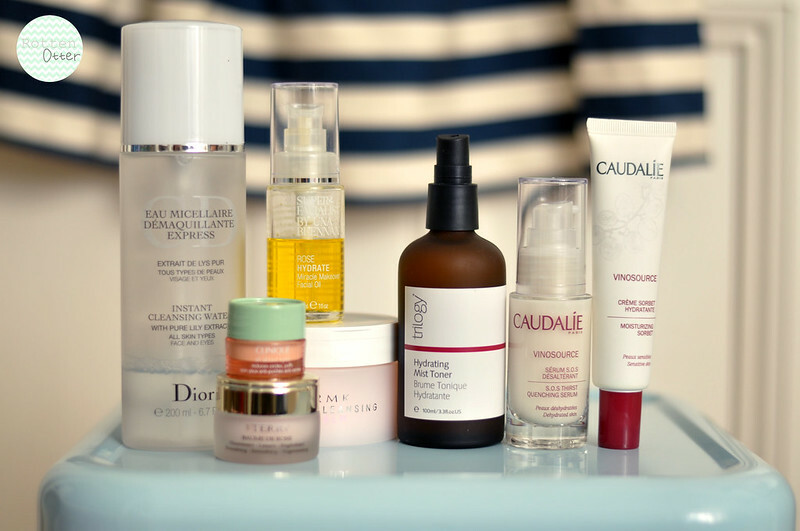 I would say I've used my Dior Creme de Rose balm & Clinique cleansing balm so much this past month! The hydrating mist toner sounds lovely, I'm thinking of buying a similar one myself since I do suffer from drier skin.